The Function Point Modeler™ support team is there to help you should you ever have an unforeseen problem using it. 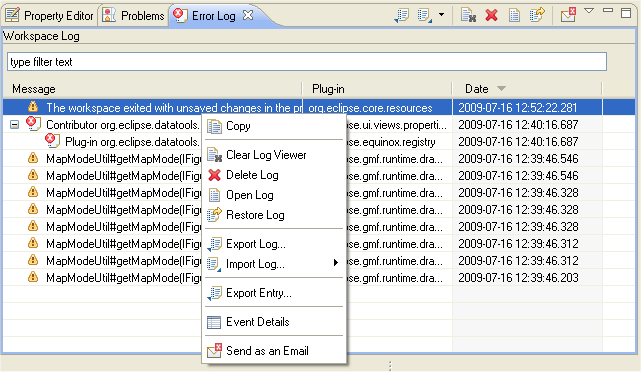 Function Point Modeler™ has the best defect & update management system built on the Eclipse. Each technical and some business defects are showed in the following Error Log View. You have the ability to send the technical defects in the Error Log View direct to us using the mouse click. We will fix the technical defects as soon as possible and provide you a new fixed Plug-In. Function Point Modeler™ Update Manager will detect the fixed Plug-In and updates itself automatically. The Function Point Modeler™ support team is there to help you should you ever have an unforeseen problem using Function Point Modeler™. Function Point Modeler™ has the best defect and update management system built on the Eclipse platform. Most of the UML Modeling tools are implemented on this platform, which enables smooth integration of Function Point Modeler™. Eclipse enables multiple organizations to work together on this platform. The application on the Eclipse platform runs on Linux, Mac OS X and Windows-based systems. Function Point Modeler™ is a IFPUG CPM 4.x.x conform function point modeling tool. Function Point Modeler™ includes formulas to calculate all three types of function point counts (development project, enhancement project, and application) according to CPM 4.x.x.